﻿ Petunia Information | Walnut Springs Nursery, Inc.
Petunias Dying In Landscape Beds – A Problem You Might Be Having In The Landscape. Steve Sullivan of The Brickman Group sent us a photograph , and a manager from Akehurst Landscape Company called in last week to inform us that they have been finding large beds of Wave Petunias that are dying rapidly. As the issue could be caused by a number of presently active botanical diseases, laboratory testing is required to identify the issue. 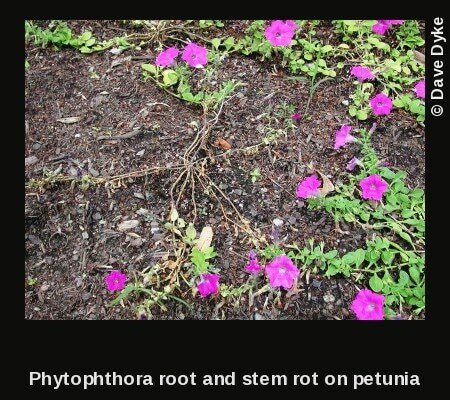 Recently the Plant Diagnostic Laboratory encountered specimens of several varities of Petunia, including Wave Petunias out in the landscape that were found to be dying of “Phytophthora Parasitica” a fungal disease commonly referred to as “Aerial Phytophthora Blight” or simply “Blight”. This particular disease favors hot, wet weather. The fungal disease “Sclerotium Rolfsii” commonly referred to as “Southern Blight”. Presents as small spherical sclerotia and white mycelium on mulch, and on plant stems at the soil line. The fungal disease “Rhizoctonia Solani” commonly referred to as “Rhizoctonia Web Blight”. Presents as fine, wispy mycelium with a tan coloration, particularly noticeable in the early morning while dew is still present on the plant. Causes a visible breakdown of plant tissue, observable as the appearance of “melting” in the afflicted plant. The fungal disease “Sclerotinia Sclerotiorum” commonly known as “White Mold”. Presents as tufts of white mycelium on the stems of afflicted plants and dark, irregularly sized sclerotia approximately 52mm in length. The most common symptom of “Phytophthora Parasitica” is the black base or shank of the stem. Infection is usually through the roots. The roots are initially water soaked then rapidly become necrotic. In young plants, the stems become brown to black and the darkening can extend up the stalk several centimeters down into root system, then the plants damp off. The pathogen can directly infect the leaves, brown-to-black or large circular lesions occur following wet weather. Once “Phytophthora Parasitica” is present in the landscape, it will remain dormant in the soil and recur to afflict plants annually. Some Landscape Managers have reported that if the pathogen is detected early enough and replacement plants are available, treatment with fungicide and replanting the affected area offers good results. Effective fungicides for the control of “Phytophthora Parasitica” include – SubdueMaxx; Alliette; Terrazole; Alude; Heritage; and Compass, best practice to ensure succesful treatment is to refrain from the placement of susceptible plants in the afflicted area for a few years. The following plants are reportedly NOT susceptible to “Phytophthora Parasitica” – Impatiens, Begonia, Chrysanthemum, Coreopsis, Dianthus, Geranium, Phlox, Portulaca, Rudbeckia, Verbena, and Zinnia. These plants may be good choices for planting in areas following an infestation of “Phytophthora Parasitica”. The following plants have been reported to be affected by “Phytophthora Parasitica” and should not be placed in afflicted areas. These include – Tomato, Tobacco, Peppers, Pansies, Madagascar Periwinkle (Catharanthus), and Petunia. Once “Phytophthora Parasitica” is present in a bed a rotation of crops not susceptible to the pathogen is recommended for a few years.